A two-days festival that aims to transform the city into an open-air stage: Enna Buskers Fest is back with its 3rd edition! An event that involves adults and children in recreational, artistic and cultural activities: workshops, shows, music, exhibitions and a lot of surprises in every corner of the beautiful city of Enna, the “navel” of Sicily, a land that brings together everything that makes Sicily so unique. 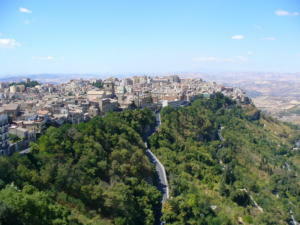 Just 2 hours away from Palermo and Catania: Enna is the perfect destination for a short getaway! Take a look at our Villas near the main cities of Sicily selection and choose the villa of your dreams! For two days, September 14th – 15th, the itinerant, dynamic party of Enna Buskers Fest with its joyful atmosphere will invade and enliven the streets and squares of the old center. 2 days of celebrations with free shows with acrobats, jugglers, fire-eaters, musicians, activities for children – origami and painting – and art and craft exhibitions! There are 20 unique shows scheduled so far, with 30 artists who will alternate with replication twice a day: so get ready for 80 shows in two days! And moreover, you’ll get the chance to discover the heart of this incredible island. Enna has several panoramic viewpoints, while attending the Festival, take a walk through the ancient ruins an feel the pulsing life of the glorious, past era. Or maybe you’ll rather discover Enna’s naturalistic side walking in the woods, visiting enchanted places. Enna’s cuisine is famous throughout Italy: its culinary delights combine simplicity, with genuine and greedy ingredients, and traditions. Rediscovering the flavors of the past will be really amazing. Browse www.facebook.com/ennabuskersfest/ for more information! Book now a holiday villa in Sicily with Scent of Sicily!